Flavor Profile Delicate and bright with just a hint of vanilla. 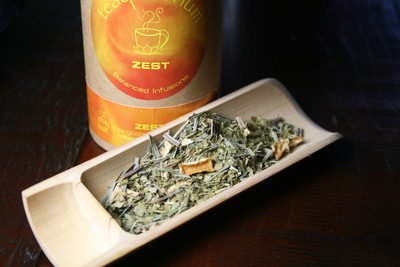 Ingredients Yunwu Green Tea, Green Rooibos, Lemongrass, Ginger, Lemon Myrtle, Oatstraw, Lavender, Ashwagandha, Natural Flavors. This is truly a joyous tea! The green tea flavor is light and smooth. I don’t get a strong “grassy” or “vegetable” taste to this, although there is an overall herbaceous background to this cup. The green rooibos add just enough “sparkle” and lightness to the cup to keep it from being too overwhelmingly creamy. As you can probably ascertain from my previous comment, this is a very creamy cup of tea. The vanilla tones are sweet and undeniably creamy, but I think that the presence of the lemony tones help to cut through some of the sweetness so that it doesn’t come across as cloying. The result is a flavor that is quite decadent and dessert-like without being too sweet. The ingredients list ginger as one of the ingredients, but I must tell you that I really don’t taste much from the ginger except for possibly the faintest hint of spice in the distance. It is barely noticeable, and had I not read the ingredient list, it is not something I would have commented on because it is that faint. The same is true of the lavender and the ashwagandha (aka Indian Ginsing). There is absolutely no bitterness to this tea, and no real sign of astringency either. It is sweet and luscious and a bit like what I’d imagine it would taste like if I were to put a slice of lemon meringue pie in the blender with some green tea. I really enjoyed this tea – much more than I thought I would. It’s one of the better lemon/vanilla or lemon meringue type teas I’ve encountered. It’s so yummy, that I’d recommend this tea based on flavor alone … consider the health/emotional wellness benefits a bonus! This tea has a lot going on, but, it works! The base of green and white teas alone is rather interesting, consisting of a white tea (Pai Mu Tan) and several different green teas. In the sample I received, I didn’t find any jasmine pearls, but I can definitely taste the presence of jasmine in this cup. It is a soft note of jasmine, but I like that its there. The white tea is not very distinguishable in this cup, although, I don’t think that this tea would taste the same without the white tea. While it isn’t easy to discern specific “white tea” qualities, it is obvious that there is more than just green tea notes. The base tastes lively and smooth. There is some vegetative taste to the tea as well. There is no bitterness to this tea. A moderate amount of pucker-y astringency at the tail that works very well with the lemony flavor. Although I didn’t notice any of the yogurt bits in the blend when I measured out the tea, I must have gotten some in there because I can taste the tangy taste of yogurt. The yogurt along with the combination of teas (and this is where I suspect the white tea plays a role) create the creamy note of this tea which is not overwhelmingly creamy, but just enough to tie in with the name of the tea. I’m not left asking “where’s the cream?” with this tea. Overall, this is a very interesting and delightful cup of tea. It isn’t too pungent or over-the-top, nor is it too subtle with its approach. A very nice tea makes me think of spring on this cold winter’s eve! Complete your heavenly scones with my deliciously “sweet and tart” lemon curd. Freshly made with eggs, sugar, water, butter, lemon puree and tapioca starch, my lemon curds are always a winner! In my review of Heavenly Tea Gathering’s Organic Scone Mix, I compared the flaky, tender texture of the prepared scones to my grandmother’s pie crust. Well, this Lemon Curd from Heavenly Tea Gathering is almost (almost!) as good as my gramma’s lemon meringue pie filling! Put the two together, and you have the most delectable tea-time treat imaginable! This lemon curd is sweet with just the right amount of lemon-y tartness. The lemon flavor is bright and sunny but doesn’t come off as pucker-y. The curd is very custard-like, just like the smooth filling of a lemon meringue pie. I have tasted a LOT of lemon curd, but I can honestly say that this one is the best I’ve ever tried. I love the creamy, custard consistency – I could eat it right out of the jar! Yeah – it’s that good! 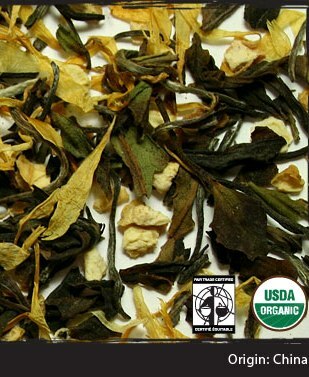 A full leaf white tea, this is a super smooth brew with a full mouth feel. The lemon essence is distinct but not to the point of overwhelming the mild flavor of the base white tea. A perfect balance of flavours with plenty of anti-oxidants. The exact origin of the lemon has remained a mystery, though it is widely presumed that lemons first grew in India, northern Burma, and China. In South and South East Asia, it was known for its antiseptic properties and it was used as an antidote for various poisons. Today, India is the largest producer of lemons and generates 16% of all lemon and lime output worldwide. This tea was a very pleasant surprise. I expected the lemon to completely overwhelm the white tea, but it is very well-balanced. 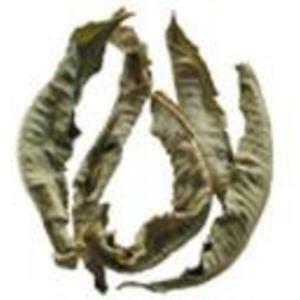 The white tea tastes fresh with mere whispers of a vegetative quality. Shanti Tea does not specify what type of white tea leaf this is, but, if I had to guess, I would say it is a Bai Mu Dan. 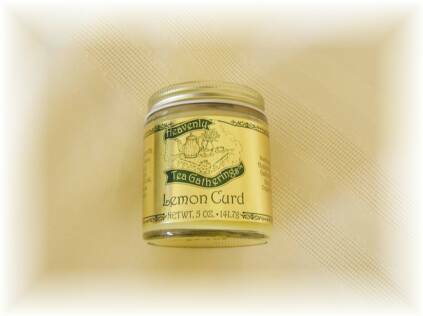 It has a crisp flavor that melds very well with the bright flavor of the lemon. And while the lemon flavor stands out in the cup but it does not overwhelm the white tea as I thought it might. It has a sweet, lightly tart, sunny flavor that is delightful. I am enjoying it hot at the moment, but, it is equally as delicious iced. I found this to be an extraordinarily uplifting, refreshing cup of tea, and it is certainly one of the best lemon flavored tea I’ve tasted yet! Bravo, Shanti Tea! Earl Grey is the most popular flavored tea. 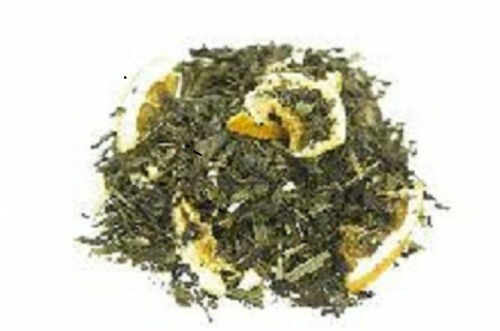 This classic has been known for ages as a black tea, and green tea lovers have long waited for the Sencha variation. But now, your waiting has come to an end. We introduced this blend very successfully some years ago. Our exquisite Sencha base was flavored with high-quality bergamot flavor and richly decorated with lemon peel and orange blossoms. Earl Grey friends can now finally discover green tea – and vice versa. As many of you are well aware, I love Earl Grey black tea. However, I’m not always so keen on Earl Grey green teas. Sometimes, I find that the bergamot and green tea just don’t jive, but, occasionally, I’ll find one that gets it right. Well, ESP Emporium got it right! I suspect that it is the addition of the lemon peel and the orange blossoms that make the difference here, as well as the lightened flavor of the bergamot. ESP Emporium didn’t go heavy on the bergamot with this blend. It is light and crisp with a hint of tangy citrus flavor. The taste is clean and delicate enough to let the sweet, fresh taste of the Sencha tea to come through. 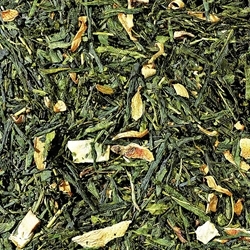 The Sencha tastes refreshing, with nutty notes and a hint of butter. There is a faint astringency that doesn’t completely dry the palate, but, cleans it enough so that the buttery sensation doesn’t linger and allow the tongue to become sodden with a buttery taste that muddles the other flavors of the tea. I really like this Earl Grey variation. It is a delicious twist on a familiar taste for me. It is a tea that can be enjoyed hot or iced, and if you like a little sweetener in your Earl Grey this one would take well to that addition (but be light-handed with it, or you may overwhelm the cup), but I don’t recommend adding milk to it. This tea is far too delicate for such an addition. I would recommend this to all Earl Grey fans out there! It’s a winner! Teaquilibrium’s Energizing Sport Tea contains yerba mate, a South American herb known for its plethora of health benefits. A study of yerba mate at The Pasteur Institute and the Paris Scientific society in 1964 concluded that mate contains “practically all of the vitamins necessary to sustain life.” Mate is also a natural source of caffeine, theobromine (dark chocolate’s euphoric stimulant) and theophylline (tea’s soothing stimulant) which stimulate the central nervous system to create calm energy and mental clarity. Yerba Mate fuels your muscles and nourishes your body with 15 amino acids, 24 vitamins and minerals including Vitamins A, C, E, B1, B2, Niacin (B3), B5, B Complex. Natural phytochemicals stimulate your immune system and boost your metabolism. But I’d much rather use THIS Zest as my “eye-opener” – and it certainly does do just that. The lemon-y flavor is bright and clean… and shall I say it? Zesty! The delicious, lemon-y flavor curbs the earthy notes of the yerba maté. This is not overly earthy or grassy tasting, it is quite smooth for a yerba maté, which sometimes can come off as a little bitter. I’m not getting that with this cup at all! The lemon-y flavor is not incredibly tart, although there is a faint, tangy note at the finish that lingers a little bit with a tingly sensation on the tongue. This is something that is almost barely noticeable unless you’re focusing on it, though. Mostly what I get from the lemon is a smooth, sweet citrus-y taste that reminds me a bit of lemon curd. I like to steep this energizing drink in a vessel that I can keep the leaves continually steeping as I sip… so I am using my Libre Mug. I put the loose leaf into the main chamber, and then add the hot water and allow it to steep for five minutes, then I screw on the filter lid and the filter lid strains the tisane as I sip it. Since yerba maté lacks the tannins of tea leaves, it doesn’t get bitter from lengthy brew times – it just gets more flavorful!